This little tram-type vehicle ascends the arch over the stadium and when you arrive at the viewing platform at the top, there’s a spectacular view over Durban and its beautiful coastline. You can stay as long as you like looking at the view and make sure you walk all the way around and spend a bit of time gazing in each direction to make the most of your trip. You can also see down into the Shark Tank stadium next door. When you’re ready to come down, you might need to ask the security staff to send the tram as it tends to stay at the bottom if there isn’t a steady stream of customers. We thought the SkyCar was one of the best experiences on our trip to South Africa and well worth the ticket price. Other things to do at the stadium include the ‘Adventure Walk’ – which is basically a trip to the viewing platform by the stairs instead of the SkyCar. You’ll need strong legs for that one! There’s also the Big Rush Big Swing where the you’re attached to a rope which is fixed on the arch and swing from one side of the stadium to the other. There are also a number of stadium tours including one by Segway. 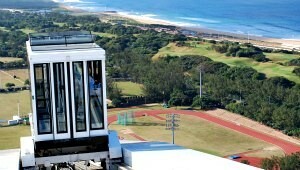 The SkyCar at Moses Mabhida Stadium operates from 9am to 5pm daily. Adult SkyCar tickets are 60 Rand, the Adventure Walk is 90 Rand and there are discounts for pensioners and children. Big Rush Big Swing operates every day except Tuesday & Thursday and costs 695 Rand (2015 Prices).